Steve holds degrees from the University of Pennsylvania and University of Maryland. He is certified as a personal trainer by the National Strength and Conditioning Association (NSCA), with over 15 years of experience. His previous personal experiences include Olympic lifting and power lifting. 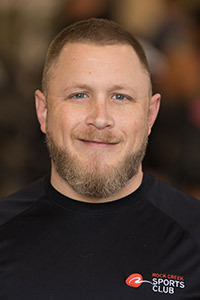 He won a silver medal in the masters division of the Maryland State Powerlifting Championship (held by the Maryland State Powerlifting Association, the state chapter of the USAPL) in November 2014 and holds four Maryland State records. Today, Steve trains clients for overall fitness, including core strengthening and stability progressions with basic resistance training exercises. He has worked with clients with a wide variety of health issues including rotator cuff problems, knee and hip replacement. In 2010, 2012 and 2015 Steve received honors from Bethesda Magazine for being one of the area’s top trainers. Devin is a graduate of the University of Maryland with a BS in Kinesiology. He has been a certified personal trainer through ACE since 2008, as well as a NSCA-certified Strength and Conditioning Specialist since 2014. Basic Olympic Lift certified, Devin has been competing in powerlifting since 2013 and is currently the world heavyweight strict curl champion. 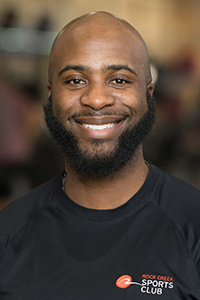 Although Devin’s training is geared towards powerlifting, he prides himself in being an extremely versatile trainer and will design workouts for your specific goals. Devin believes everyone should strive to improve their own movement patterns in order to build strength through a full range of motion. 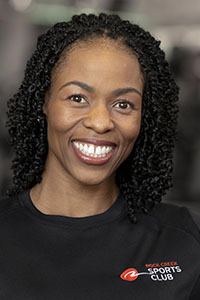 Angela is certified as a personal trainer and group exercise instructor through AFAA, and is a Balanced Body Instructor in Pilates Mat 1 and Mat 2. She has been in the fitness industry for almost 20 years. Angela has successfully trained clients for fitness competitions, class reunions, weddings as well as everyday life. 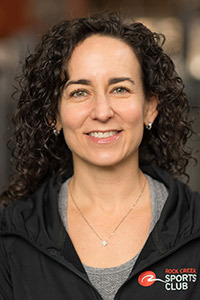 She specializes in incorporating Interval Training, Boxing, Pilates and/or Yoga into her training sessions to enhance client results, designing workouts that are efficient and effective. Her fitness DVD “Tighten Up” was released in 2005 and encompasses her training techniques. Angela holds a BS in Communications Studies from Northwestern University in Evanston, Il. She received her JD from Washington University School of Law in her hometown, St. Louis, MO. Sharon is the Fitness and Operations Manager at Rock Creek Sports Club. She is certified as a personal trainer by National Strength Conditioning Association (NSCA) and has over 20 years of fitness experience. Previous athletic experience includes track, softball and competitive bodybuilding. Sharon’s philosophy is live life in the balance. She has a BS in Computer Science from Florida State University and is mom to 4 children. 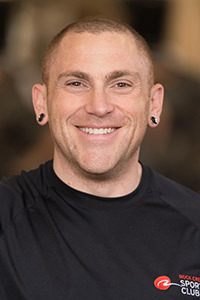 Zach is certified as a personal trainer through the National Personal Training Institute (NPTI) where he studied strength training and kinesiology. He also holds the Basic Olympic Lifting Certification (BOLC). Zach attended Yeshiva University in New York and The Genesis Institute in Jerusalem, Israel and has spent time traveling in Europe. 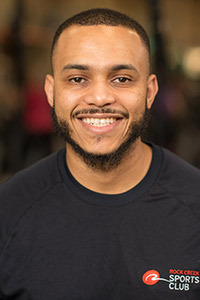 Originally from Hyattsville, Md., Kolon holds a bachelor’s in science in Rehabilitation Science and is a World Instructor Training School certified personal trainer. Kolon works with clients of all ages and fitness levels, and specializes in weight loss and nutrition education training, speed and agility training, performance training, post rehab training, and sports performance training. Kolan stays in shape by running, playing basketball, swimming, and his his spare time he enjoys watching sports and comedy, plus — just relaxing once in awhile! 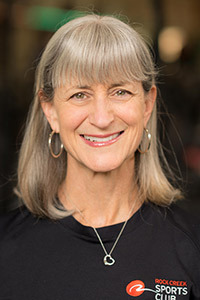 Jean is certified as a personal trainer by the American Council on Exercise (ACE) and a Corrective Exercise Specialist with National Association of Sports Medicine (NASM). Jean has had a lifelong interest in fitness and nutrition, and recently began competing in triathlons and 5ks. Jean works with clients to translate short and long-term goals into fun, safe and personalized training sessions. She provides clear exercise schedules, email reminders and guidance on nutrition. Jean trains both exercise novices and experienced athletes, and helps clients suffering from joint, weight and flexibility issues. When she’s not at Rock Creek Sports Club, she volunteers at N Street Village, where she leads a fitness class for homeless women. Jean has A BA from the University of Chicago, a JD from NYU School of Law, and is a mom to three daughters. She also enjoys hiking and canoeing and listening to live music with her husband. 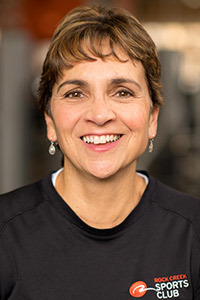 Tina is a certified personal trainer from the World Instructor Training School and a certified running coach from the Road Runners Club of America. She also holds a BA in Anthropology from Haverford College and a MS in Education from University of Pennsylvania. Whether you’re a beginner and looking to discover the joys of physical fitness, or training for triathlon, Tina is your woman. She believes that “once you incorporate fitness as part of your lifestyle, you’ll wonder how you lived any other way!” Originally from Tia Juana, Venezuela, Tina has lived all over, and during her spare time she enjoys swimming, cycling, running (triathlons! ), reading, and traveling with family. Isiejah is certified by the National Academy of Sports Medicine (NASM) as a Performance Enhancement Specialist. A native of Silver Spring, MD, Isiejah attended Gonzaga College High School in NW DC, then Fordham University in NY, where he obtained a B.A. in Business Administration and Communications. Isiejah is also a professional athlete, having competed in football and rugby. Using many different modalities of training, Isiejah works with clients of all ages and fitness levels. Isiejah helps his clients with weight loss, strength, sport-specific training, balance, and coordination. Isiejah also understands that a safe workout environment is conducive to achieving maximum results. Julie is certified as a personal trainer through the National Association of Sports Medicine (NASM) as well as a certified TRX suspension training instructor. 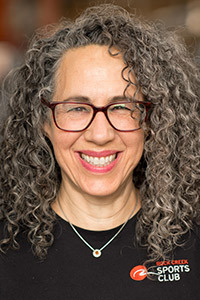 Julie’s original career was a construction project manager with a BS in construction management/structural engineering from the University of Washington. While she has always been active, Julie grew to love lifting in college and eventually moved from the construction business to the fitness industry. Just like a building needs a strong base, Julie focuses on improving her clients’ foundation and movement patterns during strength training to benefit them in their everyday activities. Healthy living and eating is a priority at home. However, her husband and three children will tell you that Julie’s favorite saying is “everything in moderation, including moderation.” For her own workouts, Julie enjoys lifting, bodyweight workouts and cycling. Gorica (pronounced Go-rit-za) was born and raised in Gorasde, Bosnia and Herzagovina. 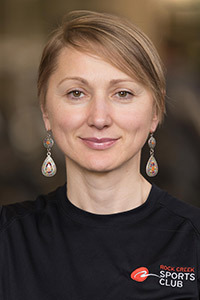 She earned a AA in Physical Education from the University of Belgrade, Serbia and an AA in Business Administration from Strayer University, Washington, DC. Gorica has lived in the DC area since 1997 and feels this is home. 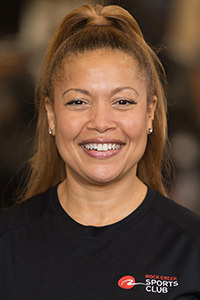 Her personal training certification is with NASM and her specialties include motivational coaching, increasing stabilization, flexibility and strength, Powerlifting, Yoga and partner training. Avi is a personal trainer certified by the National Academy of Sports Medicine (NASM). Avi developed an interest in weightlifting during his teenage years while volunteering as an EMT for the Rockville Volunteer Fire Department. Over the years he has trained under a number of competitive bodybuilders, gaining extensive knowledge in advanced bodybuilding techniques. Avi also has a background in Tae Kwon Do, competing in multiple tournaments and earning a Black Belt from the World Martial Arts Association. 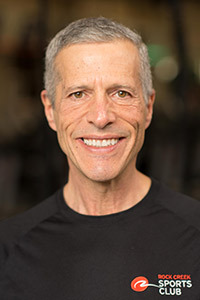 Whether training for weight loss, core stability, or strength and physique enhancement, Avi uses his martial arts experience to help clients focus on the connection between body and mind. Avi is a graduate of the University of Scranton. Originally from Grand Rapids, MI, Samantha became interested in fitness at an early age. She was inspired by her mother, who was and still is very active and health conscious. Samantha became certified as a personal trainer in 2012, and went on to get her Nutrition Specialty Certification in 2015. She most recently received her Level 1 Balanced Athlete Certification in 2017. Samantha played soccer growing up and now enjoys running, weight lifting and yoga-inspired workouts. While she loves working with all types of clients, Samantha specializes in the active aging population and incorporates a training style geared toward healthy living and injury prevention. Her number one goal as a trainer is to make fitness safe, effective and fun! 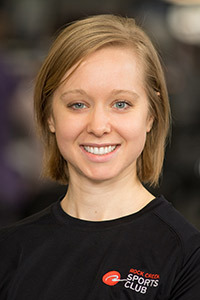 Emily is a certified personal trainer through the American Council on Exercise (ACE). She has been participating, competing, or teaching various forms of physical activity for two decades. 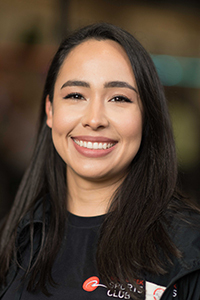 Though her background is in dance, she is currently a successful competitive powerlifter, most recently earning her spot on the winning Team USA at the 2017 world championships. She also enjoys training for more endurance related activities such as backpacking and enjoys hiking with her dogs. Her training philosophy is that visualizing success and remaining consistent is the key to reaching any goal. 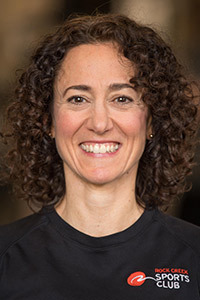 Alvina is a certified personal trainer through the National Academy of Sports Medicine (NASM). She is also a certified group fitness instructor through AFAA. Alvina moved to the Maryland area from southern California, where she had been a fitness instructor since 2012. She has always embraced an active life, participating in track and field, volleyball and dance. Alvina is highly motivated and passionate about physical fitness and has always been invested in health and wellness. She is excited to share her love and passion for fitness through group fitness instruction and personal training. She truly believes the fountain of youth lays within our awareness of the mind, body and spirit connection. 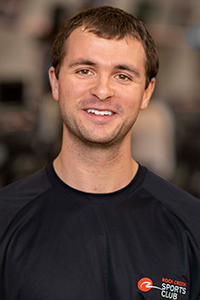 Michael is a certified personal trainer through the National Academy of Sports Medicine (NASM). He’s also certified as a Corrective Exercise Specialist through NASM. Michael is a graduate from Salisbury University where he obtained a BS in Exercise Science. 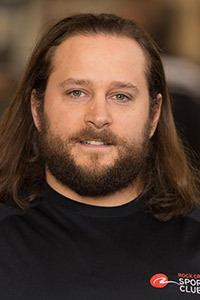 He has been in the field of Physical Therapy since 2016 and also competes in Powerlifting. Michael works with clients of different ages and fitness levels. He helps his clients with strength training, mobility, and injury prevention. Michael’s philosophy on exercise consists of setting personal and attainable goals that can be achieved through consistency, hard work, and physical and mental motivation.